NYE is coming and Deep Sugar is here for it! The return of our NYE themed night “Gided Disco” for the best House Music atmosphere to wrap up your holidays and ring in your New Year!! You already know it’s amateur night everywhere else - avoid the mess and come dance all night with those that know how to do it best!! 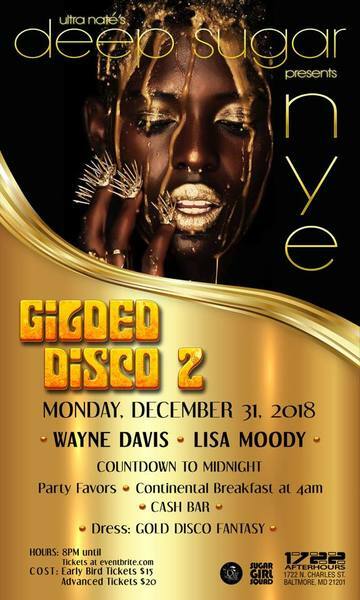 Gilded Disco 2 brings the fun and opulence to NYE! The dress code once again is “golden disco fantasy“ so bring it on! Go as far as your imagination can take you!! Grab discount tickets while they last cause it’s more at the door! When the venue reaches capacity only ticket holders will have the magic to still get in! Baltimore’s own “Big Papa” Wayne Davis - the “Godfather” of Bmore House will be spinning all night along with “Girl Squad”’s DJ Lisa Moody!